Evidently I didn't have enough to do in preparation for Pennsic. 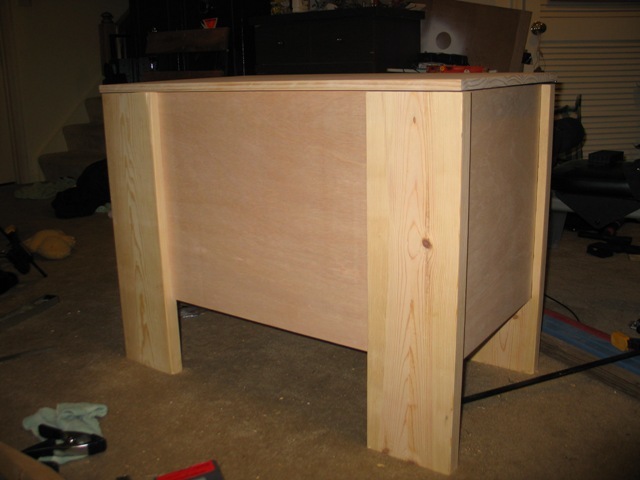 After reading Tom's Blood and Sawdust page, I've wanted to make a knock-down hutch to hide a cooler at events. Packs flat for easy transport, does a wonderful job of hiding a cooler while keeping the cooler accessible. While not nearly as nice as Tom's, I think it will do well enough. I still have to paint and finish it, which I hope to do this weekend. Someday I'll take the time to actually learn how to use my tools better. I learn more everytime I make something, but I'm always somewhat disappointed. In this case, the plywood chipped in some places when I cut the boards to size. When I was routing out the legs where the front panel connect some of the wood splintered. I'm sure I'm the one doing something wrong, and I need to get some good woodworking books and do some reading. Details: 100% linen fabric for both the undergown and overgown. 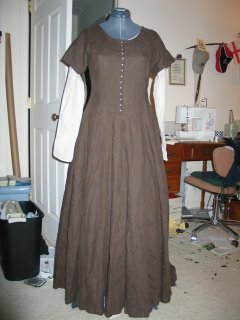 I sewed most of it by machine, but I finished the sleeve hems, neckline, and buttonholes by hand. The buttons I had purchased from Billy and Charlie's ages ago, and I was thrilled when I discovered I had enough. I didn't have to make them! The closeup shows some detail, but you may have to click on the image to get a larger picture. I came to realize that I really do not have a talent for handmade buttonholes. The next FO is actually only mostly done. The reason the skirt is on the dummy and subsequently attached to the bodice is to mark the skirt for hemming. The bodice is a modification of a pattern I had and I'm real pleased with how it has turned out. 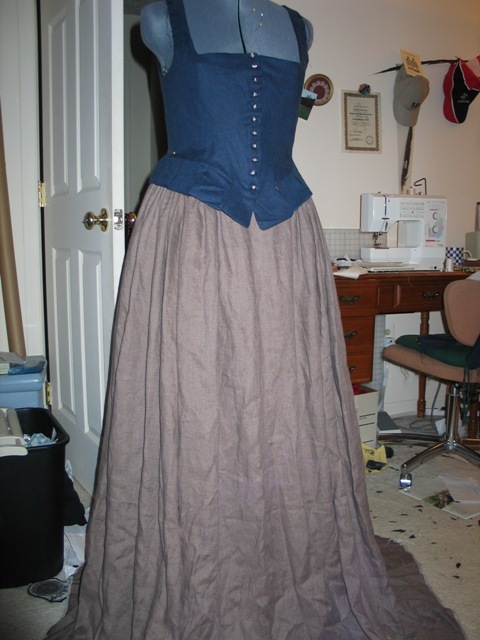 The bodice needs the epaulets and of course sleeves. I'm not making the sleeves for Pennsic, however, so they will be laced on at a later date. The skirt and bodice are also 100% linen. The skirt is cartridge pleated. 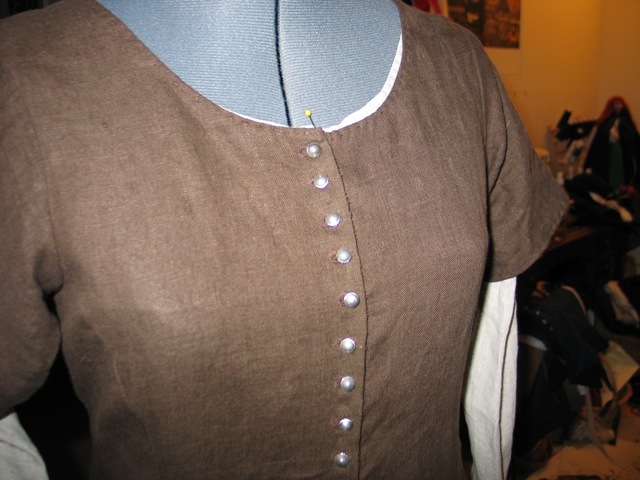 The buttons on the bodice are cheezey JHB plastic buttons (I know) in the shape of a knot, so they do okay (for Pennsic anyway). They are about the same size of my handmade buttons, so I can replace them later. I'm excited. I'm beginning to see the end of the gotta-hurry-up-and-sew-for-Pennsic tunnel. I can't believe I didn't post ANYTHING last month. I've been very busy getting ready for Pennsic. Spousal needs new clothes, I need new clothes, it's never ending. I have started: a skirt, a bodice, two doublets for Spousal, and two cothardies for me. What's finished? A doublet for Spousal. Skirt needs a closure, bodice needs handwork and eyelet holes, doublet needs handwork and buttons, and the two cothardies, well, let just say they still need some work. I do have help! Lots and lots of help! 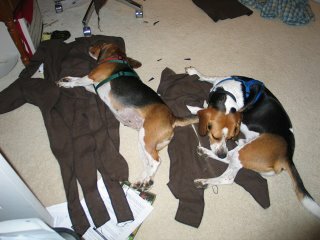 Boogalu and Pearl decided that laying on the pieces of the dress I was about to sew would be wonderful help. There was something about this dress that attracted at least one dog to lay on it whenever the dress hit the floor. Despite their efforts, the dress is further along than shown in this picture .